Placing clients at the heart of the digital banking journey. Fenergo is the digital enabler of client and regulatory technology for financial services. It provides Client Lifecycle Management (CLM) software solutions for Financial Institutions including; Corporate & Institutional Banking, Commercial & Retail Banking, Asset Management, Private Banking & Wealth Management. Counting 70 global Financial Institutions as clients, its award-winning CLM suite digitally transforms how Financial Institutions manage clients; from initial onboarding to KYC/AML and regulatory compliance, to data management and ongoing lifecycle KYC reviews and refreshes. 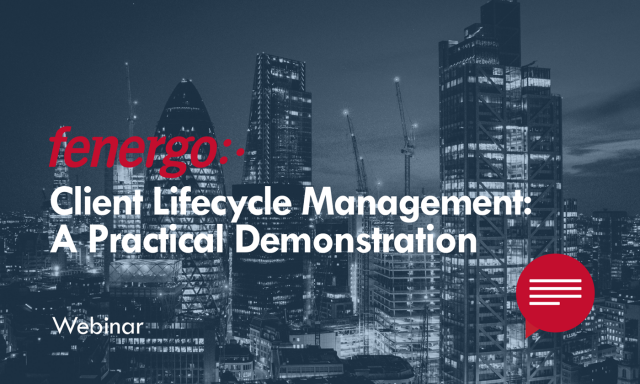 Fenergo CLM empowers financial institutions to deliver a faster, compliant and digital customer experience while achieving a single client view across channels, products, business lines and jurisdictions. A practical demonstration of the industry's leading regulatory automation solutions and services, market research, insights and best practices. This special webinar aims to ensure compliance, regulatory, risk and operations professionals are armed with a key insights into how to solve the problem of regulatory change when it comes to KYC, AML & Client Lifecycle Management.